Of course, the problem with seeing something like this is that sudden need to own one. We're already planning where our very own GameCube unit will go in the Nintendo Life office (we don't need computers anyway, right?) and we imagine we've caused a similar issue for plenty of you reading this. Sorry. Would you like something like this? Perhaps a shelving unit in the shape of a Switch, similar to the huge Switch TV display we shared recently? Tell us below. Looks great. I would love one, I don’t have the space. I would love one, I don’t have the space. I would . . . I actually had to move my bed out in order to fit in more bookcases for games. Silly bed was in the way. 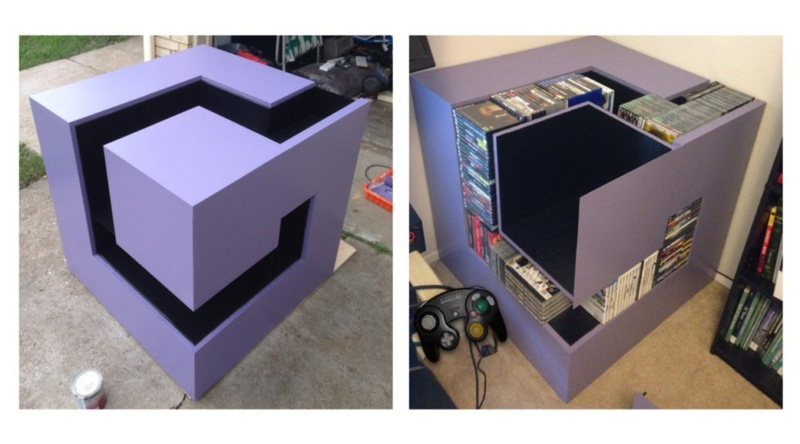 I assume the removable cube bit at the top is the perfect size to house the Gamecube in right?! That was such a cool logo. Not 100% sure the storage is really efficient but I like it. This I really like! But is it just me, or does that controller look... odd? I can't put my finger on it, but something about the image seems edited or something. @Heavyarms55 I see what you mean. It looks like it was badly photoshopped in but it could be the lighting that is causing it to look like that. Now if you'll excuse me, I'm going to get the measurements to make one of these for my Switch collection! @Heavyarms55 The controller looks bigger than the game cases. Maybe an optical illusion, weird! Too inefficient and takes up too much space for my tastes. But it's a cool looking unit and I like seeing stuff like this that people make. This is cool but i think it looks better without games in? You can't really tell its the GC logo once its filled up? This is actually a few years old already. 9gag & Pinterest era stuff! Cool looking, but a little too big and impractical it feels like. If I could buy this thing I would, it would look great in my house. Very creative, wish I was able to do stuff like this. Did I miss the "GameCube year" or something? There is a lot of GameCube thingy (like the cute Lego one) it seems! Thats looks awesome. I have a similar N64 table I got off of esty a few years ago. Doesn't store games tho. That is nice. @SenseiDje I think the center is an open space? Must be removable. If you look around behind it is all open, possibly, to store more things? So on just the one angle, when it is closed it looks like GameCube. I need one of these. If it's strong enough it could always double up as a seat (if you got a cushion for it!). Don’t want to be that guy, BUT, filling the shelves with games kills the aesthetic .